The role that Livingston College played in keeping journalism alive at Rutgers University after journalism curriculum entered a precarious fight for its survival in the 1970s [was] one focus of a special “legacy” program sponsored by the Livingston College Alumni Association on Wednesday, April 21, , 7 p.m. at the Livingston College Student Center in Piscataway, N.J.
Key players in the original drama [gathered] to remember the past. But the program also [examined] the future challenges in the 21st century as the print and broadcast news media urgently redefine themselves in light of the new media and Internet revolution. Alumni, faculty, students, editors, publishers and journalists are welcome to join in the discussion that I [co-moderated] along with Marty Siederer, the Livingston alumni president. The School of Communication and Information Alumni Association and Livingston Dean Lea Stewart [were] co-sponsors of the program. The New Jersey Press Association (NJPA) played a critically important role in lobbying successfully for the “re-creation” of a journalism department after the School of Journalism, one of the oldest in the United States, was deactivated at Rutgers College and replaced by a Department of Human Communication in the early 1970s. A groundswell of concern from publishers and editors resulted in the Rutgers University Provost authorizing me to reconstitute the journalism department on the New Brunswick campus. In 1978, the Board of Governors and the N.J. Department of Higher Education approved creation of a new Department of Journalism and Urban Communications at Livingston College at a time when the individual colleges such as Livingston, Rutgers, Cook and Douglass controlled their own free-standing curricula. A year later the university’s governing board and the state higher education department also approved creation of the Journalism Resources Institute (JRI) which I founded and directed. Over 14,000 journalists participated in programs during my tenure, and again, NJPA support from its publishers, editors and reporters was crucially important. When the New Brunswick campus was consolidated into arts and sciences and professional studies faculties in the early 1980s, journalism at Livingston went campus-wide. I was named by the provost, along with the directors of the library sciences and communication programs to design a new entity to bring our related disciplines under one tent. The School of Communication, Information and Library Studies (SCILS) was born with the Journalism Department and JRI able to preserve their identity and join the new school as a full partner. The school was a pioneer -- one of the first in the United States -- in bringing together journalism, communication and library studies as sub-disciplines with their own identities but able to interact in the new world of communication and information that was changing rapidly and technologically complex. Together, we formed a critical mass strong enough to survive the recurrent storms of budget crises, and enjoyed superior building facilities, shared computer and audiovisual resources, and vastly expanded interdisciplinary opportunities for the students and faculty. Luckily, journalism today is alive and well at the School of Communication and Information (SC&I), the new name for SCILS, with a solid department of Journalism and Media Studies, a long track record of service to the profession through the Journalism Resources Institute (JRI), and a new Dean, Jorge Schement, who is committed to a vibrant journalism program in the school, at both the undergraduate and graduate levels. The Livingston Legacy program on April 21 [included] among its panelists, Dean Schement and myself; Roger Cohen, emeritus professor in journalism and former acting dean of SCILS; John O’Brien, Executive Director of the New Jersey Press Association; John Pavlik, chair of the journalism department at SC&I and director of JRI; four of my former students, two of whom also taught at Livingston -- Barry Orton, Professor of Telecommunications at University of Wisconsin-Madison and Jay Miller, Professor and Chair, Communication Studies and Theater, Ursinus College -- and Robert W. Snyder, Associate Professor and Director of Journalism and Media Studies, Rutgers-Newark, and Jim Simon, Professor of Journalism at Fairfield University. The Livingston College Legacy series can point to many programs the college influenced and that are campus-wide at Rutgers University today such as journalism; computer sciences; urban planning, policy and community development; comparative languages and literature, anthropology etc., that had their roots in the exciting but controversial incubator that Livingston was as the newest college on the New Brunswick-Piscataway campus, opened in 1969. From the creation of the George Street Theater to African-American studies, or leading edge approaches to sociology while housing “Transaction” magazine, or an innovative physicians associate program, Livingston and its founding Dean Ernest Lynton and his successors nurtured an experimental, “let’s try it” atmosphere. Livingston faculty later dispersed among the larger, consolidated campus faculty in the 1980s, bringing with them their own special brand of commitment to students as individuals, engaging them in a humane, proactive, interactive learning environment they developed at Livingston College. In my case, I joined the university faculty in 1969 after ten years in journalism and a recent Nieman Fellowship to Harvard. Having first accepted an offer to teach at Rutgers College, I instead decided to join the Livingston College faculty at the urging of Dean Lynton who could be a compelling advocate for his dream of new approaches to university curriculum and learning. There, we developed an Urban Communications program within the Department of Community Development (in the Division of Urban Planning and Policy Development, now the Edward Bloustein School of Planning and Policy Development) that encompassed the newer technologies then emerging -- from CATV to portable video field equipment, and a still evolving Internet testing the beginnings of electronic publishing. Students were involved in all of our grant-funded , community efforts from programs to assist municipalities in writing better CATV ordinances in the public interest, to multimedia documentation of environmental concerns in New Jersey communities, documentation of the work ethic, or creation of a full-fledged media training center in one community as part of an anti-poverty program. The core courses in reporting, editing and multimedia documentation formed a natural platform upon which we built the revived Department of Journalism when the opportunity arose. Richard Hixson, a respected, senior journalism professor switched from Rutgers College to Livingston because, he said, that was where journalism now thrived. Other faculty including Roger Cohen, David Sachsman and Thomas Hartmann brought additional strengths, and a strong adjunct faculty of journalism professionals gave us added lift. The code name for all of this might as well be “Lazarus” because journalism was back from the dead. In my book, From Ink on Paper to the Internet: Past Challenges and Future Transformations for New Jersey’s Newspapers, I have a chapter tracing the origins of journalism at Rutgers University. It all began with a few courses organized by NJPA and eventually evolved into the School of Journalism by 1926 at Rutgers College. Yes, the school was deactivated in the 1970s but the embers were kept alive, glowing hot, long enough for journalism to be rekindled on the Livingston campus, and then introduced back into the entire New Brunswick-Piscataway campus through SC&I by the early 1980s. 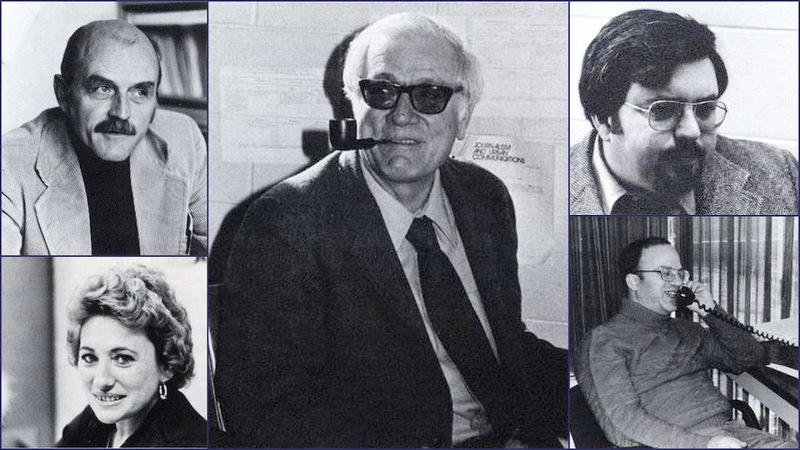 Bottom photo: Livingston College Journalism and Urban Communications faculty, as seen in the 1981 yearbook, The Last: Richard Hixson (upper left), Thomas Hartman (center), David Sachsman (top right) and Roger Cohen (lower right). At lower left: Bernice Weinberg, department secretary. Not shown: Aumente (department chair), and faculty members Juliet Lushbough, Warren Sloat, Emily Van Ness and Roxanne Zimmer. 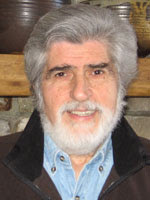 Jerome Aumente is Distinguished Professor Emeritus and Special Counselor to the Dean, School of Communication and Information (SC&I) at Rutgers University. He was founding chair of the Department of Journalism and Media Studies and founding director of the Journalism Resources Institute, both units in SC&I. Email him at aumente@rutgers.edu.